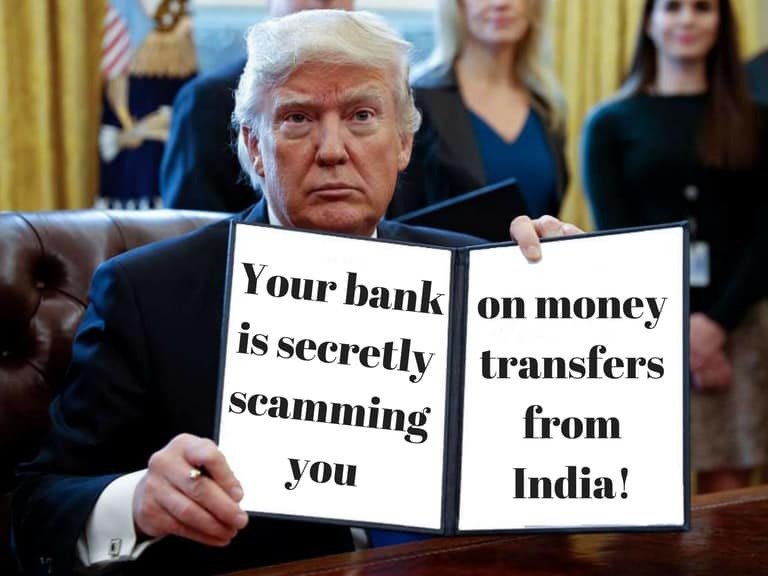 Don’t get scammed sending money abroad from India via your bank! If you are a student, parent or any others person simply looking to send money abroad from India, the first thing that probably comes to your mind would be to contact your bank. Another alternative you might take is to approach money changers recommended by your friends or relatives. However, is this really the best way of sending money abroad from India? Are you getting scammed by banks and money changers on International money transfers? Let’s find out below! Banks and money changers offer exchange rates with their high markup worked into it. It means, if the USD to INR exchange rate is ₹68, you can sometimes find that you are being charged ₹70 or ₹71! You’ll be levied a flat service charge for sending money abroad from India. This is in addition to their markup in bad exchange rates. You should check how much you are being charged for the service and if it is higher than the industry standard. So you have initiated the forex order and now what? Get ready for haggling with the bank staff and sitting the whole day in a bank branch. Fill forms and submit your KYC documents. If you commit any mistakes in filling the forms, prepare to take a new one and redo the process. The help and support of staff are non-existent at best. First timers to a bank might relate very well to this experience. No bank staff to help you out. Money changers fare better in this respect and offer better customer service. However, in both cases, usually, there is no easy system to track the status of your money transfer order. You might have to keep calling your relative or friend abroad asking them if they have received the money. Otherwise, you’d have to call the bank or money changer and enquire them about the same. Here Comes The Saving Big Part! ExTravelMoney has tie-up’s with 13 RBI authorized money changers. Additionally, we have more than 4500+ forex stores spread across many towns and cities in India. We have agreements with these money changers to provide forex at very competitive and market-beating exchange rates. The service charges levied are fair and never excessive. The charges are specified while placing the money transfer order itself and are transparent for you to see. More purchasing power and choices to you! Using our site you can get the list of forex centers near you with their exchange rates, service charges, and customer ratings. This means you have a lot of forex purchasing options to choose from. You can select the one offering the best exchange rates, service charges and place the order. You also get additional facilities like door delivery of forex and locking of the exchange rate for the day. 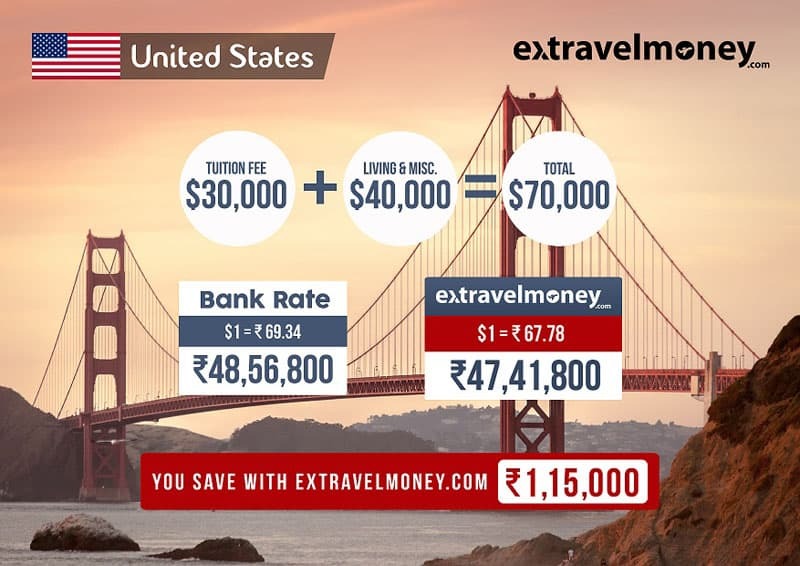 With ExTravelMoney.com, you can transparently view live remittance rates and do international remittance from the comfort of your home. Our simple online platform makes sending money abroad from India a breeze. We guarantee swift delivery of funds to the account abroad within 48 hours max. When you place a forex order, our customer service agents will get in touch with you via the phone number provided by you and guide you through the process. Form filling and KYC documentation are taken care of by the customer care agents from the forex store chosen by you. Also, you’d receive periodic updates regarding the status of the order directly to your phone and email. All in all, the process would be smooth and a stark contrast to the ways of how banks process forex orders. This is probably one of the best things about ExTravelMoney. When customers select their forex requirements, rates quoted by forex centers near them for that service are shown. Usually, a customer will go for the service which costs less money. Again, only those forex centers offering lower rates would get more orders. This transparency in rates and service charges leads to competition between money changers to grab customers driving the rates down! Scam me once, shame on you, Scam me twice, shame on me. Before you are scammed a third time by banks, just come to extravelmoney!